We can certify the effectiveness of functional and smart textiles, using both sensory and molecular test methods. Full textile testing range with Sensenet’s partner institute Aitex. Our client was developing fabrics designed to treat malodours. He wanted us to design a test to demonstrate the performance of their technology in eliminating important odorants and compare performance between treatments. The client dosed the materials with sweat malodour and asked us to evaluate the residual smells from the fabric and report which fabric was reducing the level of key odorants most effectively. The test combined molecular and sensory analysis using a technique called Gas Chromatography-Olfactometry (also known as GC-O or GC-Sniffing) alongside molecular assessment through Gas Chromatography Time of Flight Mass Spectroscopy (GC-ToFMS) to determine the sensory information of the products based on their chemical compositions. The GC-sniffing technique adds an extra performance dimension to the molecular analysis performed using GC-MS systems, allowing us to “smell” the chromatogram. Headspace air samples were prepared using thermal microchambers. The headspace captured the volatile compounds associated with odour generated under controlled conditions. For each fabric a ‘full scan’ molecular analysis was undertaken on the headspace sample. This analysis quantifies the concentrations of all detectable compounds in the headspace. The chemical composition of air samples were then compared between fabrics. Additionally, a sensory assessment was undertaken on individual chemical components as they were separated by the GC-column. Each odorant detected during the sensory assessment was allocated a descriptor and was assessed for odour intensity. When possible, the molecular assessment was used to identify chemicals associated with each response in the sensory assessment. Figure 1. Sampling preparation by thermal microchamber. The GC-O analysis allowed us to compare the odorants present and compare the fabrics’ performances in reducing the concentration of the odour compounds. A number of compounds associated with cheesy, rancid, sour and sweaty notes were positively identified during the assessment. These compounds were distinguished as being among the principal contributors of sweat odour. The relative strength of these compounds could then be compared between the samples in order to assess performance. Figure 2 presents a graphical representation (spider chart) of the odorants perceived during GC-O classified in general categories. The most prominent odour categories are cheesy, fatty/waxy and phenolic. Here we can see that fabrics S1 and S2 retained the unpleasant cheesy, sweaty, sulfur notes more than the other test fabrics. Figure 2. 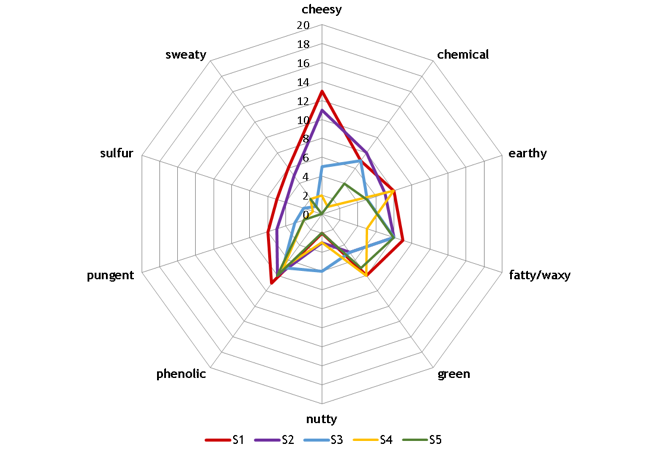 Spider chart representing a general profile and a sensory comparison of the samples tested. The testing demonstrated which of the fabrics was most effective in removing the malodour. This data could be used by our client for proof of claim of product performance and to refine R&D efforts.